We took a look at excuses people use to not market including not knowing how to start, what to do, and how to handle the increased numbers if it worked. When you are small (or non-profit), the public is more apt to cut you some slack and are not expecting all the bells and whistles. Plan first. Develop a strategic marketing plan before you start then decide what type of efforts it will take to make that happen. Be sure the plan includes how you are going to measure success. You need to be able to know if your efforts are working. Good doesn’t mean expensive, but you may have to spend some $ so present your plan to the trustees and try to sell them on the idea of allotting funds for these efforts. Test, then roll. Don’t mail the entire city a promotion. Start with 1/5 and look at results. Then decide if it’s worth it to continue. Saves paper and postage that way. Inconsistent branding. The community needs to be able to readily identify your promotions. Use caution when dealing with donations. Some come with prohibitive strings and restrictions or barter agreements that do not benefit your library in the long run. Look at value, not price A one time radio spot is not the same thing as an actual campaign. If there is no sustainability then it may not be worth it to start? Good marketing always gets measured so build measurements into every marketing initiatives. Ask “How did you hear about this?” and record how much $ was raised, etc. Your next customer is your current customer. Talk up new services to your current patrons. Are they story time parents that might benefit from one of your databases? Make friends and trustees ambassadors of the library. They should know your services and be voices in the community. Create a quality library presentation and go out and talk about it out in the community. Let them know what we can do for them. Try school board meetings, rotary, chamber of commerce, etc. Get your info inserted in church, school newsletters, that of other city departments. See if you can get a flyer in the mailings sent out by other groups. Try to develop a relationship with the schools to make use of things like internal TV, newsletters, back to school nights, etc. Place ads in the yearbook and school play programs. All communications should market a program or service. Create reader’s advisory bookmarks for patrons Solicit marketing support from vendors. Draw the public into your space by inviting schools to display kids’ artwork or the public to display their old photos. Incorporate return-on-investment statements into your annual report. Ex. Summer reading program helped 500 children retain their reading skills. Shoestring, pittance, trifling amount, tight budget, wing and a prayer, next to nothing, scratch, chickenfeed, small potatoes. What librarian hasn’t had to do more with less? 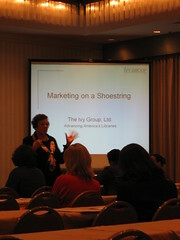 Come to collect some great ideas for marketing your library on a shoestring, presented by Nancy Davis, partner in The Ivy Group. She has 20 years of experience helping organizations – both large and small – achieve their goals by implementing innovative, cost-effective ideas that maximize resources. Marketing in a down economy is more important that ever. Our first inclination is to look at the budget and cut marketing. But the public needs to be aware of our services, because this is when we help the public the most. It won’t work, and how could we even tell? Is a state-wide library promotion campaign effective? A lot of the ideas presented seemed like after-hours work for the staff – how do we do this? How to make segmented maps of the population? How do we get staff on board with marketing? What do staff say “no” to? Can you elaborate on return-on-investment analysis? Why are there children’s specialists, market segmentation (infants are treated differently from toddlers) and special programming effort for children, but not for seniors? When hiring, we should look for people with prior experience and aptitude in this area. A responsive and supportive senior community can have a tremendous impact on the library. Enrich the lives of long-time community members (and an important voting block). It’s also good to recognize long-time patrons (cardholder for 50 years, etc. …leadership committed to serving seniors? 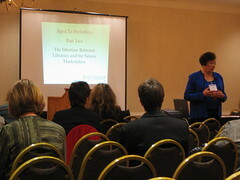 …strategic initiatives geared towards seniors? …programming and collection materials that meet the needs and requirements of seniors? …a budget line-item to support senior programs? …established customer service guidelines (and staff trained to these guidelines)? Don’t surprise them – if you promise something, do it.